This idea is a bit off the wall, but I am digging it. A garden center I went to recently had baby bathtubs filled with plants and on a colorful painted stand. At first I wasn’t sure about the idea, like most people I’m sure, but it really is both practical and vintage chic. The bathtub already has a drain, so no need to worry about moldy soil, and the crisp white color of the tub is perfect for indoors or outside. 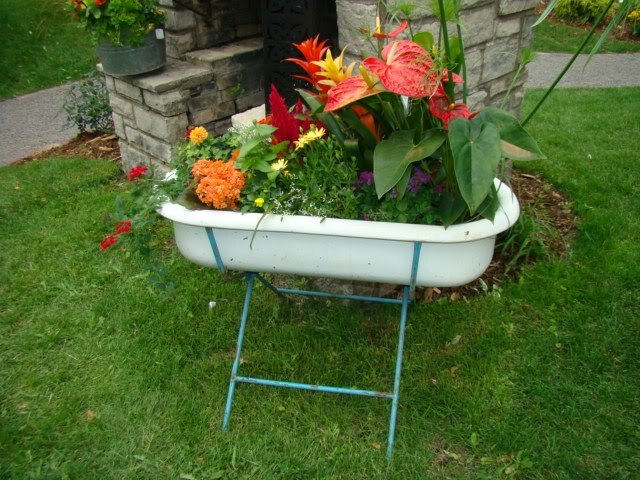 The sturdy piece makes for a unique look, definite conversation piece and practical planter. We had an antique business of strictly European imports for several years. The baby bathtubs were a huge hit! I kept one and often use it for outdoor gatherings full of ice and beverages. True, it takes a lot of ice but with the drain, the water goes right out and people can help themselves. Have also seen it used in a bathroom to hold towels. Definitely a conversation piece.